Can You Hold Gold in Your IRA at Home? You can’t avoid seeing and hearing recent commercials pushing gold and silver. Ubiquitous salespeople have added a new twist to the drumbeat of fear and greed used to sell precious metals. The newest craze is the “Gold IRA (Individual Retirement Account) at home” pitch. Hold it in your hand, love it, cherish it, and live happily ever after. Great idea, right? If it works, perhaps, but will it work? Training to become a Certified Financial Planner™ is exhaustive and thorough. Part of that training involves the rules for IRAs, and one of the fundamental IRA rules says NO to precious metals at home. What changed? Did it really change? The penalty for violating rules of IRAs, including self-dealing and buying improper investments, is the loss of tax-deferred status. The IRA becomes instantly taxable at your marginal income tax rate. Pretty severe, if you ask me. Why the sudden change to the gold-at-home prohibition? I can’t fand a sudden change. I am no CPA, nor am I a tax attorney, but I can read rules as well as anyone, and I have studied the IRS guidelines thoroughly. My conclusion is that the issue is very murky. Technical language aside, the IRS allows some forms of gold in an IRA, but it also specifies the type of trustee that can oversee the account. Whether an individual qualifies to be that trustee, or whether a gold-selling corporation qualifies, is no easy question. Unless and until I find a specific change, interpretation, or qualified tax expert, I would never own physical gold in an IRA at home. Further, I would advise all clients NOT to try this themselves. In fact, I would caution anyone to be extremely wary of this sales pitch. The penalties are serious, and there are no second chances. When our clients express an interest in owning precious metals, we prefer the electronic form of ownership. Several Exchange-Traded Funds (ETFs) exist whereby an investor can own metals by simply buying shares of the ETFs, which are backed by the physical products. We believe that the ETF-style ownership has several salient features. First, it is known to be legal and penalty-free. Additionally, there is no emotional attachment to a share of an ETF, which makes buying and selling a more objective process. We do not believe that “buy and hold” for precious metals is a good long-term investment, as the pricing fluctuates wildly over time. By paying attention, it is possible to buy low and sell high, then repeat at the next opportunity, based on price. 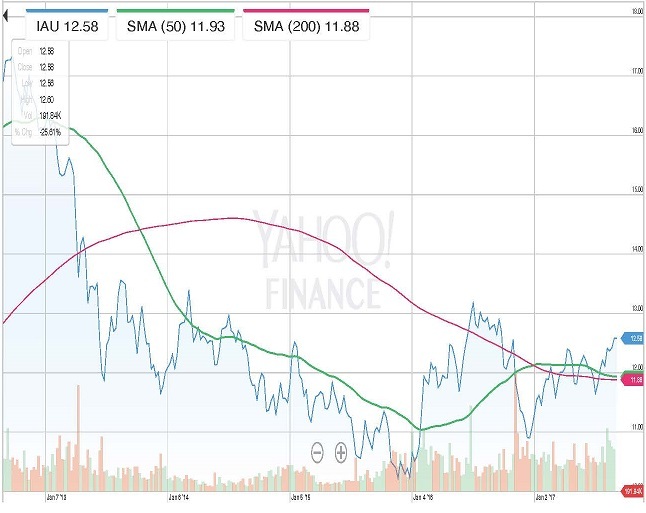 This is a five year chart for IAU, the ETF that tracks the price of gold. Does -25% return seem like a good investment to you? Many people will disagree with our very conservative view on this subject, but in the absence of a verifiable change with the IRS, we cannot advise people to have a home-based precious metals IRA.